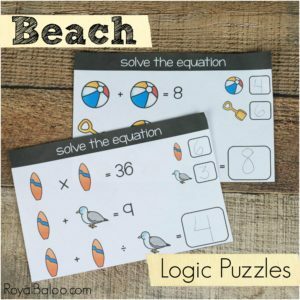 Practice math (addition and multiplication skills) and logic with these fun beach logic puzzles. 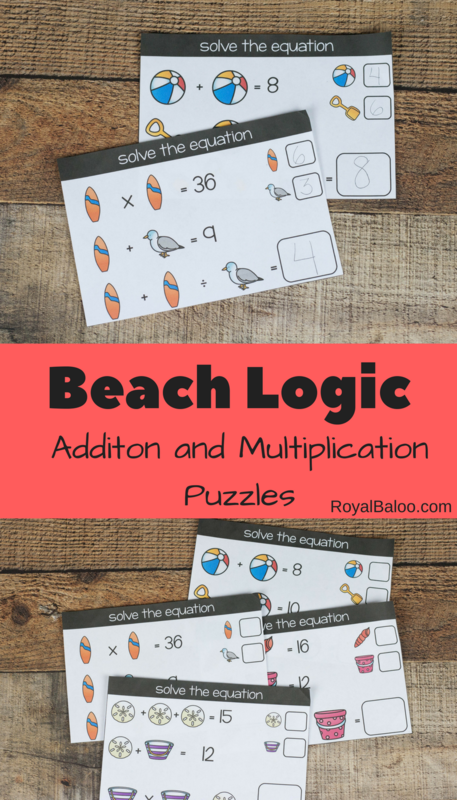 The beach theme is fun and the practice is engaging. Do you ever get caught up in those Facebook debates over seemingly simple math problems? There’s always some little trick or they make the use of PEMDAS confusing. Naturally, they’re meant to get people arguing. No lie – I love those puzzles. I try not to engage in the petty bickering over a math problem (full disclosure, sometimes I get very involved in the petty bickering) but the puzzles are interesting. They’re never hard, in a math sense. It’s more about being observant. It’s Day 3 of Beach week! 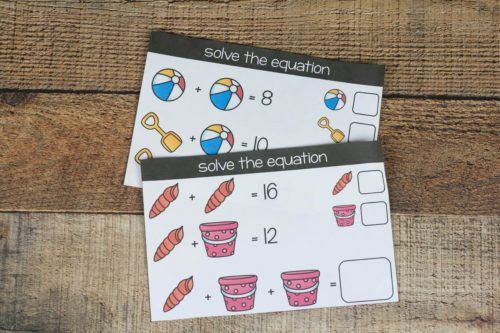 There are two more days and I have two bonus printables! They will go to the newsletter first, so make sure to sign up! I love logic games. Learning the art of deduction was something I found fun in school and it’s been a valuable tool. So I’ve been trying to provide opportunities for my kids to work on logic puzzles, too. These ones mimic the tricky puzzles you see on social media, except they aren’t tricky. 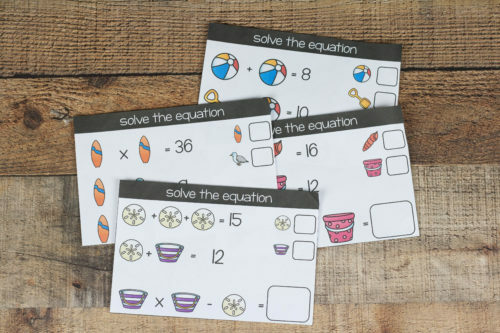 These puzzles are pretty straightforward although you do have to keep an eye on the math symbols. Each card is slightly different. I made two sets of cards for this. One set is all addition and subtraction. 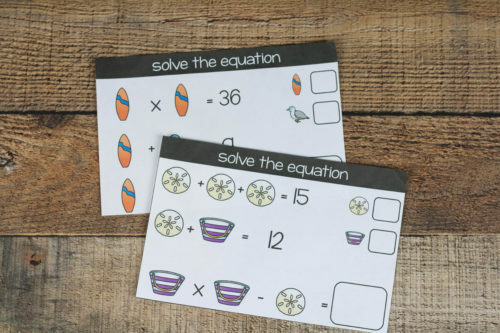 The other set also includes multiplication and division. The idea on the cards is to figure out the final equation. But to do that, you must first determine the values of each of the pictures. I intended for them to be worked from the top down. The first equation is solvable. Then, the second equation can be solved. With both of those, the last equation can be solved. On each card, the same picture represents the same number. For instance on the picture below the pink pail is worth 4. And in every other equation on that same card, the pink pail is worth 4. The cards come two to a page. For a one time use, just print on regular paper, cut the page in half, and you’re go to go. These can be printed and laminated for use in a group setting. Every person can use a dry erase marker to write on them and then wipe off the answers when they are done.